Cars break down, and when you are under the vehicle and repairing it, safety becomes the most important thing, both for you and for the automobile. There are a number of tools available in the market designed to ensure a safe working environment, and jack stands are among them. 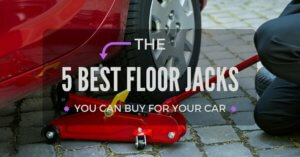 One of the most obvious and common ways to keep yourself safe while lifting your car for repair is to ensure you have a good, high-quality floor jack. However, a floor jack alone can only help you so much. This is because floor jacks comprise of moving parts that are prone to damage and wear, and they can become weak over time or outright fail with time and use. The scariest and most dangerous part about floor jack letdowns is they typically come in the form of a slow leak. As such, they are infamous for slowly letting a vehicle down on top of someone as the hydraulics drop pressure and the risk situation is usually noticed once the damage has been done and it becomes too late to escape. This is exactly why it is never a good idea to crawl underneath your car when the only support it has is from a floor jack. So, what else should you do to make an elevated car safe to crawl under? The answer is simple: add a jack stand. 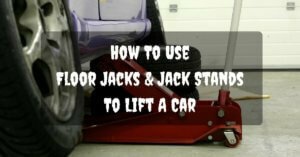 Jack stands are the primary tools for preventing cars from collapsing and slipping by providing strong support. 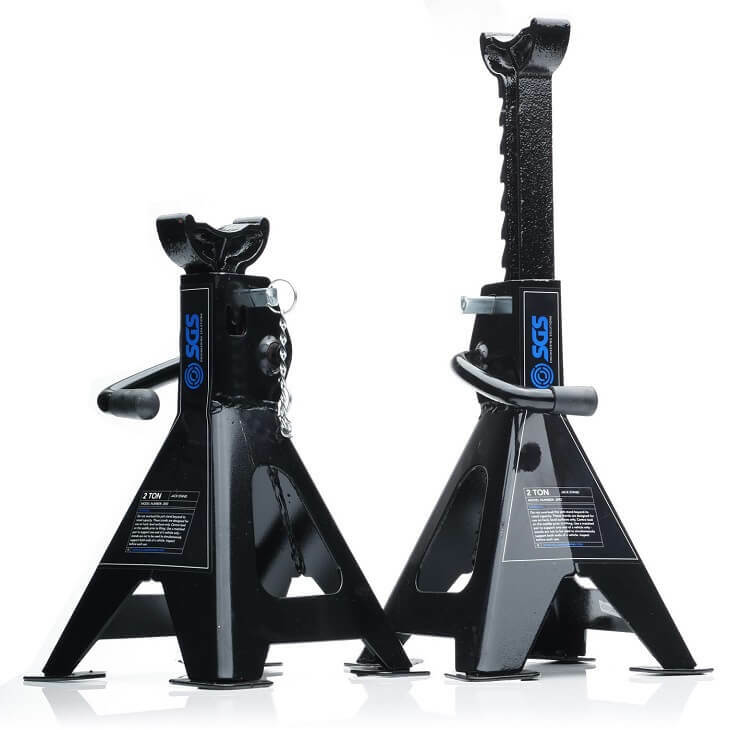 It is important to keep in mind that jacks stands are not 100% foolproof and it is therefore advised that you invest in at least two of the best jack stands. This way, should a car collapse, the stands will share the load over a larger area equally and thus prevent accidents. They are tripod or tower shaped and designed to support the hefty weight of a mounted vehicle. They should be placed under the vehicle frame or axle to offer added support for a raised car. After a vehicle is jacked up, the stands are put back in place and the car is lowered onto the stands. The saddle-shaped parts on jack stands are there to support the car axle. These stands should only be used on flat and hard surfaces and only for automobiles that fall under the weight limit of the stands. 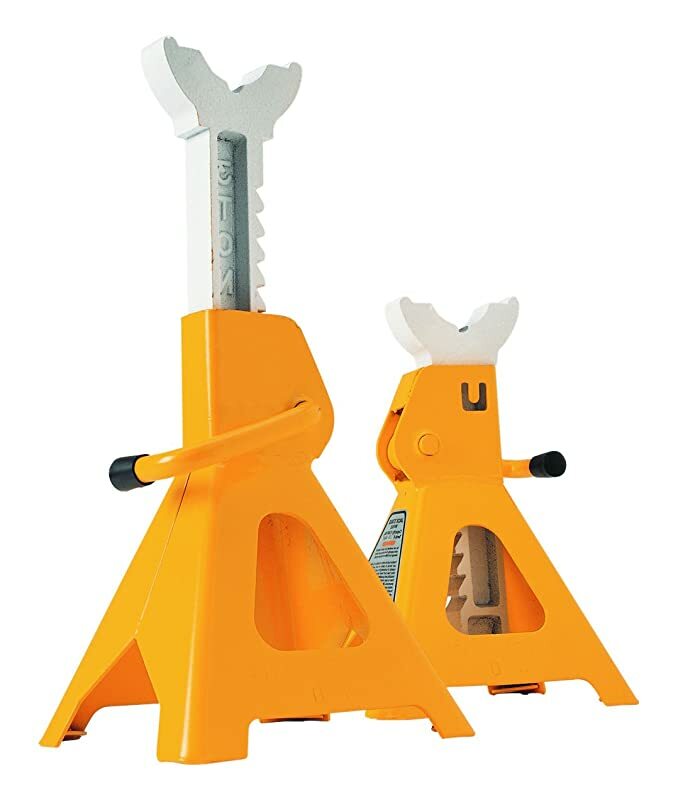 You can find jack stands in different kinds and they are categorized by weight capacity and maximum height. Most of the time, the jack stand’s weight capacity is expressed in tons and the height in inches. Typically, they are sold in pairs and usually used in combination with floor jacks. The weight capacity of the stand can go from 2 tons to 25 tons. The height can range from 13 to 25 inches, and can go as high as 6 feet. 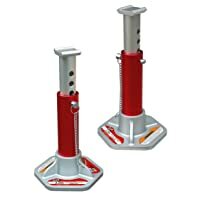 The best jack stands are not quite different from each other but the material they are made from can actually make a big difference. Lightweight, small stands are usually made from light steel or aluminum. On the other hand, heavy-duty jack stands are made from steel or cast iron. This type of stand has a fixed height, which means they have the benefit of zero moving part to fail. The downside to this is they cannot be modified and hence are neither flexible nor portable. However, these stands are highly durable and reliable and if you plan to use them with the same car, they are a great choice. 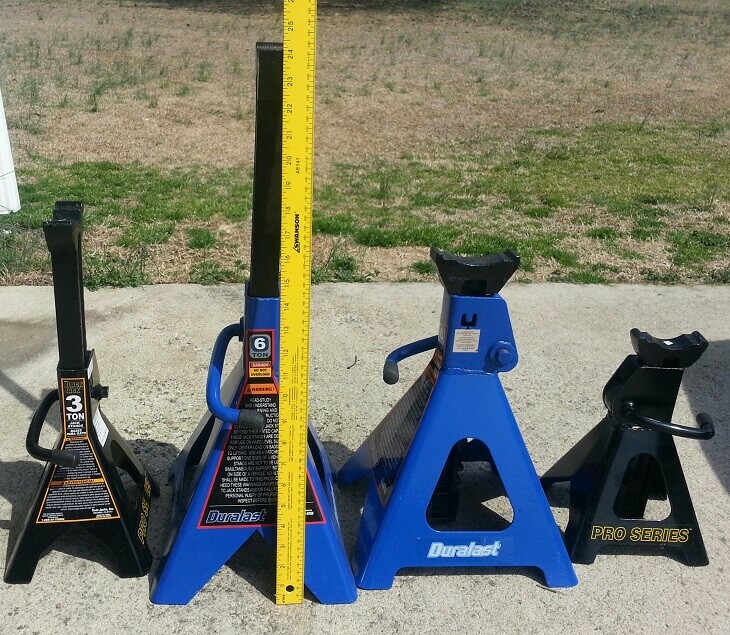 Changeable height jack stands let you adjust the height as per your preference. The most widespread type of changeable height stands is the tripod stand that uses a serrated center post for adjusting height. Heavy-duty changeable jack stands usually comprise of a steel pin that is enclosed in the holes in the middle column. Good quality stands will usually have two safety pins. 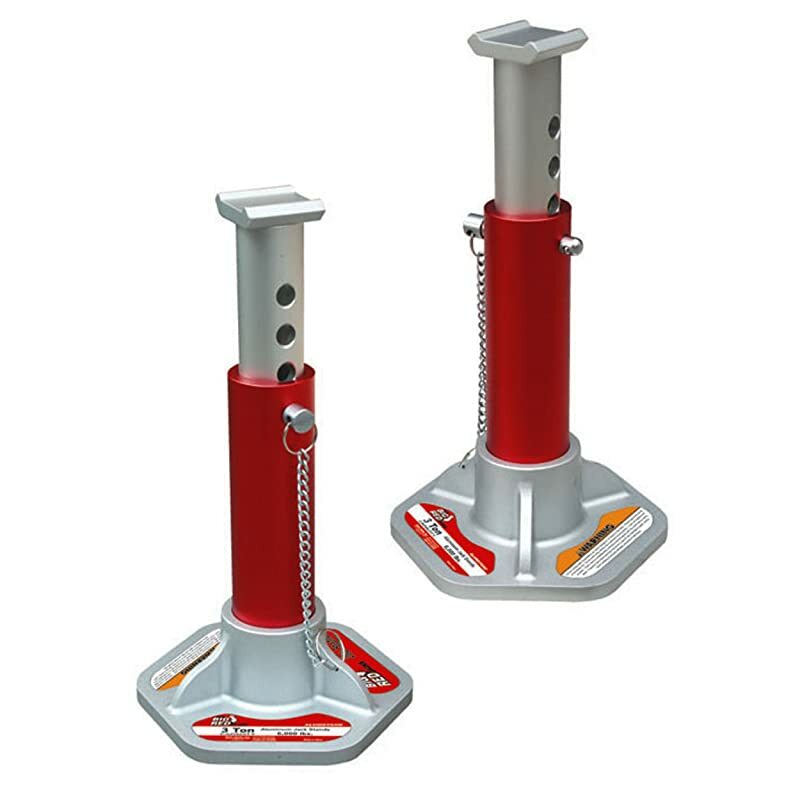 The last type of changeable height jack stands is referred to as rotation stands where the operator must twist the middle column clockwise in order to increase the height and counterclockwise to decrease it. Go through the owner’s manual thoroughly to take advantage of the best support spots and lift on the vehicle. Only use a jack stand on a flat and even surface. 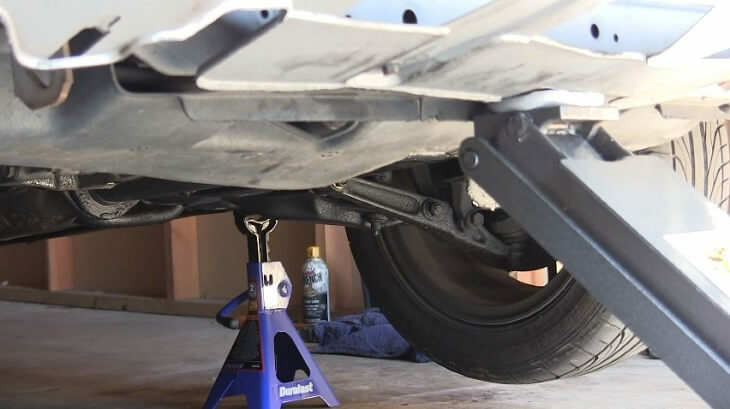 Gently give the vehicle a shake after it has been mounted on the jack stand, as this will ensure that it is secure and not going to slip when you are under the vehicle. Using a trolley jack or floor, lift the vehicle up. Only raise it as far as you need to. Don’t overdo it. Once the car is up, get down and inspect the underside to gauge where the jacking points are located. Refer to your manual if you are unsure. ​Next, take each jack stand and raise it to the right height, which should be just a few millimeters lower than the jacking points. ​Gradually lower the car until all the weight is supported by the jack stands. Give the car front a gentle shove. It should feel solid with zero movements. The car should now be safe to work underneath with the stands supporting the weight in case the car slips from the jack. The weight capacity of jack stands is expressed in tons. So, make sure the stand you buy is capable of handling the weight of the vehicle in question. If you are looking to buy jack stands for a normal car, small stands can work for you just fine. However, if you are in for added support or are dealing with a larger vehicle like a truck or AV, a heavy-duty stand made from heavy steel or iron cast is what you should go for. Some jack stands are designed higher. 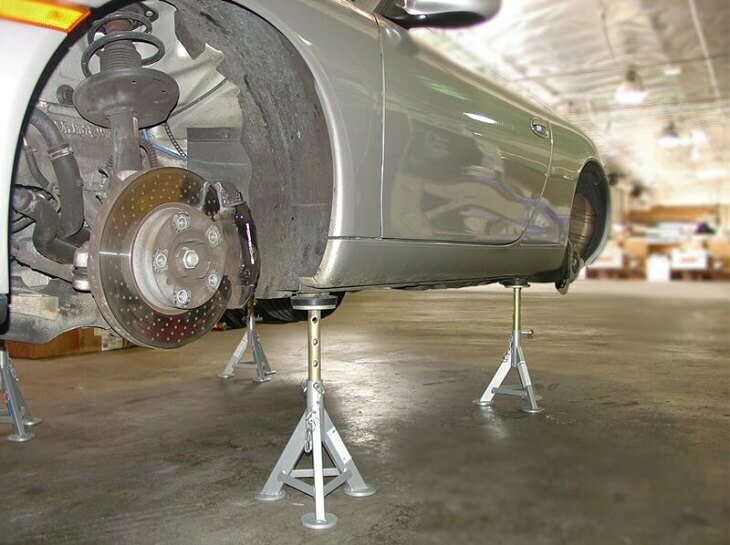 A regular adjustable jack stand can extend to 13 to 21 inches and can support up to 3 tons. Basic stand height can go from few inches to more than 6 feet. 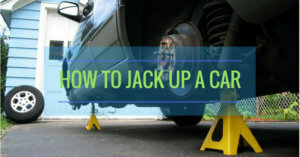 Choosing the right jack stand for your vehicle becomes easier when you know exactly what you are looking for. 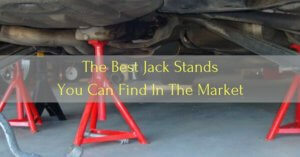 To give you a little heads up about which brands and products to look out for in the market, here is a list of top 5 jack stands you can invest in to benefit from long-term utility. First off, most jack stands on the market feature a simple design. They are equipped with a component in the center that can be mounted and adjusted into a certain position. The weight capacity varies from model to model and it is, therefore, important that you first check this in order to be completely sure about the safety factor. Other models come with a hydraulic system that keeps the vehicle in a fixed position. They are easy to use and adjustable. Torin is a well-known brand when it comes to hydraulic jacks and jack stands, so it doesn’t come as a surprise that this product is great for maintaining the stability of your car. First things first, they are made from aluminum, which is one of the most lightweight material even though not the sturdiest. The hexagonal base adds more the stability feature. This jack stand is not as wide as other models you will find on the market. Hence, it may not be the best option for people who want additional stability. 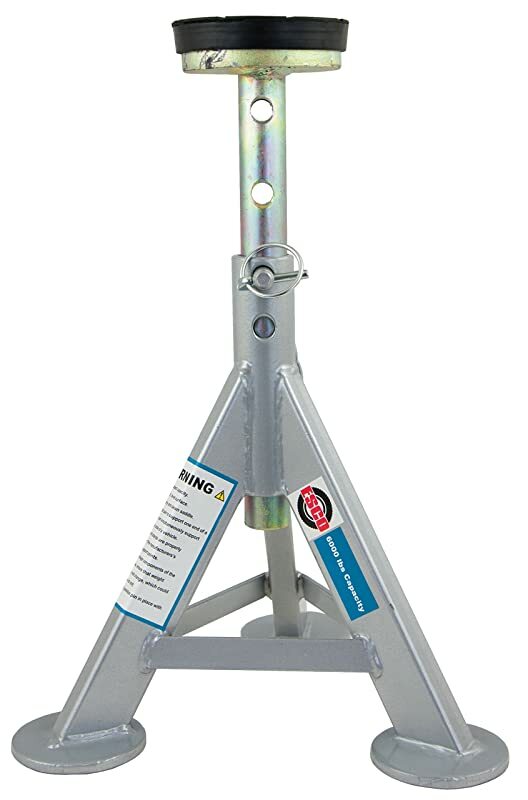 This Camco jack stand is made from aluminum, a material that is known for its light weight and durability. It is also designed in a way that makes the product stable, thanks to the base structure. In addition to that, the jack stand is also quite inexpensive ($16.90 on Amazon), which is a great deal considering that it comes in a pair. The height is adjustable. All you need to do is spin the saddle assembly. Highly stable thanks to the square foundation. Because they are a little high, it can be difficult to position them. 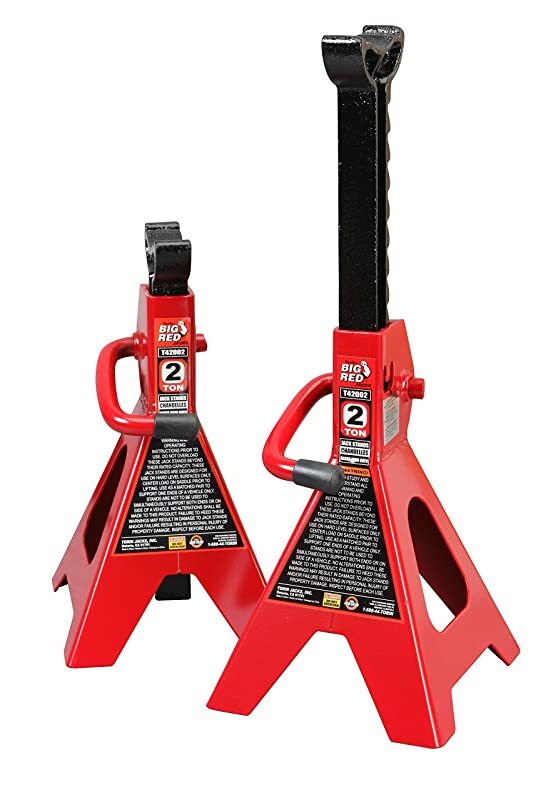 Although this jack stand is not ideal for heavier vehicles like trucks, it makes for a great safety tool for smaller, 2-ton cars, as you can easily mount your car on this jack stand without hassle. They come in multiple heights, a feature that many users appreciate. This 2-ton jack stand from Torin is best suited for cars as compared to small trucks. They come with a superb design with a welded steel construction that is form and durable. In addition, they also have an adjustable height, which means you can go on and ratchet them just over 10 inches above the ground to over 16 inches. This jack stand comes with a unique saddle. It is flat and rounded rather than concave, which aids in preventing vehicle damage when you hold it into position. Looking at the features of the 5 best jack stands, the Camco 44561 Jack Stand stands out as the winner simply because its quality is evident, especially with its economical price. Of course, if you have the cash to spare and want heavy-duty handling, you can always go for the ESCO 1049﻿8 or the Torin T43004, but for smaller cars, the Camco 44561 is ideal. Not only is it solid as a rock but also extremely stable and easy to use, thanks to the lightweight aluminum construction. Furthermore, you can adjust the height to your preference, and that is a key feature buyers look for. And with a price like that, you cannot go wrong.